Set in 63 acres of bluebell woodland in the heart of the Weald Downlands, there’s something palpably different about Shadow Woods from the moment you drive through its faintly eerie coppice woods. Fortunately, besides your imagination, there’s nothing but welcome calm awaiting you. There are 100 acres to explore beyond the confines of your elegant yurt or safari tent. And if you thought you were in the middle of nowhere trying to locate the place to start with, you’ll feel even more gloriously isolated as you wander through the wild meadow: St John’s Wort and Fleabane flowers glowing brilliantly in the sunshine, rare butterflies wheeling around. Owner and founder Pom is an ex-film producer of some renown, with modesty to match. She worked with Aussie director Peter Weir on his early films, including classics like Picnic at Hanging Rock. These days she organises candlelit opera evenings in the bluebell woods and ensures your stay is a peaceful one; for Shadow Woods is a place to regroup and rebalance your Zen, whether you’re looking for a physical pampering under a spring sky among the bluebells and trees, or some woodland edification with a few hours spent with Clive, the resident bushman. Whatever you choose to do, the likelihood is you’ll leave feeling lighter. All ready for another magical season in Shadow Woods. Cosy Yurts and quirky vehicles, The Magic Bus and Grand. Spectacular displays of our native blue bells, wild garlic and elder flowers are all one their way. 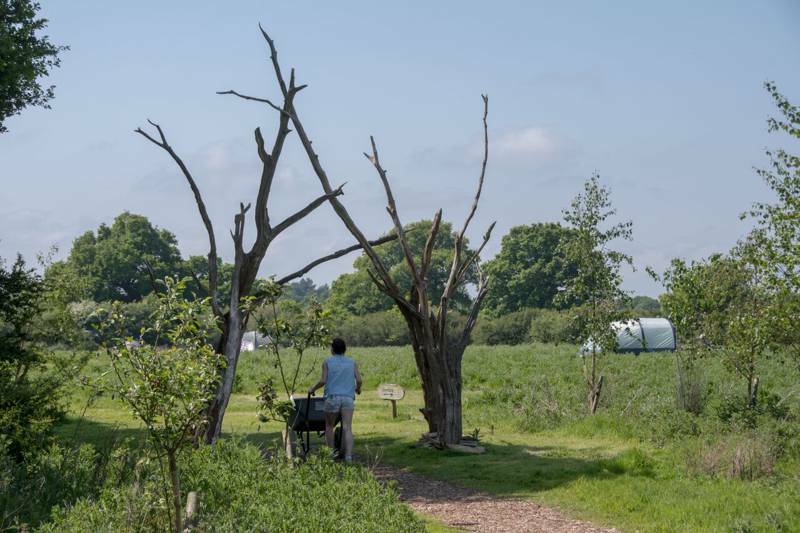 Enjoy a guided walk with Clive our Bushcraft instructor or chill out with a relaxing massage in our dedicated therapy room. only an hour from London town so why not get away for a well earned weekend retreat. 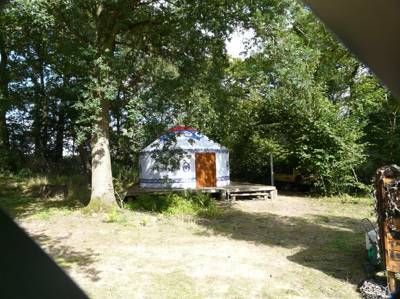 Each of the 5 yurts has its own fire pit and sits in a meadow shielded by the forest. There’s also a gloriously cosy cabin with serene views of the wild meadow tucked away in the treeline, as well as a capacious safari tent brought over from India. There are compost loos and solar-heated showers. 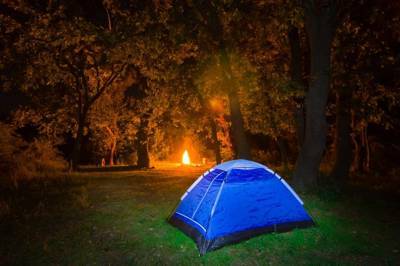 Professional bushman Clive can give you an insight into basic bushcraft (3-hour taster session £30). There’s also a holistic masseuse, Amanda, who can work away at those gnarled shoulders (1-hour massage £55). Bring your own towels, torches and kick-off footwear. Weald & Downland Open Air Museum (01243 811363) features 6 centuries’ worth of preserved rural buildings; has shire horses working the plough and resident hens, pigs, and geese. Nearby, the 100-mile-long South Downs Way follows the old drove ways along the ridges of the Downs and is perfect for walking and cycling. There's an honesty box on the site, so when you fancy some fresh eggs for brekkie, simply go to the chicken den and pick them yourself. You can also pre-arrange to receive a hamper full of organic, locally produced goodies on arrival. For eating out options head to nearby Billingshurst; the Blue Ship (01403 822709) offers homely fare and a wide range of local ales. Every Friday evening the Fox Inn serves fresh, delicious fish and chips to takeaway, so why not grab some for tea and dine outside your yurt whilst the sun sets around you. 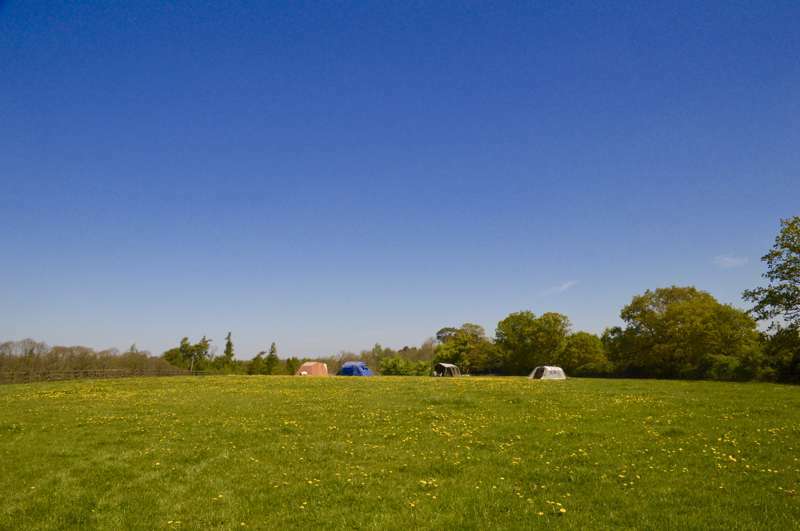 Medium yurt (sleeping up to 2) £140 per weekend/£300 per week (Mon–Sun); family yurt (sleeping up to 4) £250/£500;safari tent (sleeping up to 4) £220/£450; cabin £150 per night. Pom asks instead that you wait till you’ve made your booking to get the coordinates.